As we hustle and bustle (does anyone actually ‘bustle’ anymore?) to get our holiday shopping done, we will see a familiar sight outside of many stores and businesses. 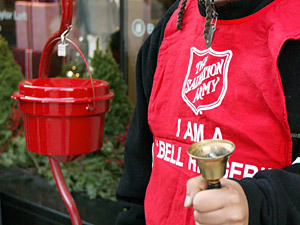 Volunteers ringing a bell and standing in front of a red kettle with the emblem of the Salvation Army proudly displayed. This tradition is as familiar as the Christmas carols that come through the speakers in nearly every mall and store in operation. I might be in a hurry, but I make a point of stopping and giving a bit, even if it is only a dollar or two. Regardless of the amount, I will likely get a smile and good holiday wishes from the one minding the kettle. There is something about that smile that is just as rewarding as the squeals and sighs I will hear on Christmas morning from the kids as they open their gifts. That smile represents thousands of families worldwide that benefit from the services provided by the Salvation Army – and it starts with every penny that goes in to those kettles. 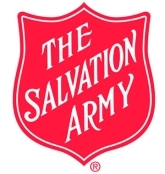 By definition, the Salvation Army is a Protestant Christian based organization that offers social services, shelter, food, and clothing along with spiritual guidance. Founded in 1865 in England and originally referred to as the East London Christian Mission, the Salvation Army was coined by it’s founder, William Booth. When he was trying to dictate the purpose of the mission in a letter to his secretary, he reconsidered the sentence referring to them as a ‘volunteer army’. Booth was said to have an epiphany which he revealed aloud… that they were not volunteers, this was something that had become a regular part of their lives. The term “Salvation Army” refers to the emphasis on a person’s spiritual well-being as well as their material and physical needs. The Salvation Army began as the East London Christian Mission in 1865 by William Booth, who at the time was a Methodist minister in England. Born in Sneinton, Nottingham April 10, 1829, he was the only surviving child of Samuel and Mary Booth. The family at one time had been quite self-sufficient, even wealthy – until bad investment decisions and his father’s alcoholism sent the family into severe poverty. At the age of 13, William was sent to live and work for a pawnbroker. During this same year, his father passed away. Two years later he was introduced to the Methodist sect of the Christian faith and began training to be a lay minister. He detested working in the pawn broking business, which he felt encouraged people in unhealthy and ‘ungodly’ behavior, so he focused on the lay ministry. Along with his studies, he also took to the streets, preaching in the open air for all who were able to hear. Booth became a minister for the Methodist church, however he soon found that limitations kept him from truly spreading the message he wanted to get across. He felt that the churches were more sympathetic to those already living their lives for God rather than trying to save ones who were on a destructive path. He married his wife Catherine in 1865, and soon after was preaching on the streets for all to hear. Some of the missionaries outside of a public house heard him speaking and were impressed enough to invite him to speak in a series of tent meetings that were being planned. These meetings were held in the Whitechapel district of London, and focused on reaching the full masses, not just those who went to church on Sundays. From this, the idea of meeting the poor people of London’s physical needs such as food and shelter gave life to the ministry, preaching in deed as well as word. It was 1878 that the idea for an ‘army’ was developed by Booth. He became the first ‘general’ or the overseer of the ministry. Other preachers held titles comparable to the military ‘officers’ and the lay-people were known as ‘soldiers’. William’s wife Catherine was also vital to the ministry. She became known in the area as the “mother of salvation” and while Booth would preach to the poor and the weary, Catherine would work at getting the financial backing from the people of means who believed in what they were doing. 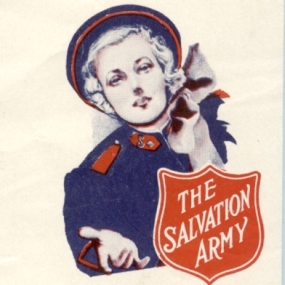 The symbols for the Salvation Army are in line with their basic beliefs. The flag, which is a background of red with a blue border and gold starburst in the middle stand for the fight against social injustices and stigmas. The red signifies Christ’s blood shed for humanity, the blue represents the purity of God and the starburst represents the fire of the Holy Spirit. The crest, which has a crown with a set of symbols underneath is also significant to their basic message. The cross is at the forefront, which of course means the cross of Jesus. The “S” that is superimposed is for the salvation that Christians believe is obtainable through belief in Christ’s sacrificial death. The swords going through symbolize the belief of spiritual warfare, or a war between good and evil for human beings souls that Booth believed was being fought daily. The words “Blood and Fire” are emblazoned to further symbolize the sacrifice of Jesus Christ and the fire of the Holy Spirit which Booth and his ministry believed would ultimately win out in the end. The ministry went well beyond simple soup kitchens and shelters for the homeless. Disaster relief often comes from the Salvation Army, and was first done in the United States on a large scale for the hurricane victims of Galveston Texas in 1900 as well as victims of the San Francisco earthquake in 1906. The Army had come to the United States in 1880, and it was with these disasters that respect was truly earned for the hard working volunteers. Thrift stores and social service centers are now worldwide, helping anyone who needs a hand up. The red kettles at Christmas time have been a time honored tradition for years, with people even giving large donations of expensive jewelry or checks in the meager kettles to be re-distributed to the poor and needy. The Salvation Army, while responsible for feeding and clothing thousands of needy people every year, is certainly not without its controversy. It has only been in the last decade that Salvation Army employees who are in domestic unions have been granted the same benefits as those who are married. Misappropriation of funds has been questioned in the United Kingdom and allegations of abuse within the Salvation Army shelters in Australia have been acknowledged. As in any organization, there are conflicts both inner and outer, that are present. Even still, it cannot be denied that many, many people have benefited from the assistance that is given. From its humble beginnings in the East End of London, the Salvation Army has grown to a world-wide mission. There are currently 124 countries that have offices and the headquarters remain in London England where it all began. One has to wonder if Booth had any idea how far reaching his legacy would be and how many years it would continue. What started as a way to help others find ‘salvation’ through taking care of their needs as well as ministering to their hearts has grown regardless of any bumps in the road. It is now an international chain of hope and giving that shows no signs of slowing down. So take a few minutes to stop by the red kettles that will be outside of the stores this holiday season. Times are tough these days, and the families that will benefit from these donations quite likely are ones that were in a position to do the donating in years past. Children will have toys under the tree that they would not have otherwise. People with no home will have a warm safe place to enjoy a holiday meal. More importantly, it is a testament to what the season is all about – the joy of giving so that others may receive.